Thousands of visitors from home and abroad challenged the autumn heat and swarmed into the Capital Museum on Tuesday, for the ongoing classical Greek art exhibition in Beijing. More than 130 art works, on loan from the Louvre Museum, mainly includes items from ancient Greece from the 5th Century BC to the 4th Century BC, have offered local visitors a good chance to sense the grandeur of Greek civilization dating back more than 1000 years. The exhibition integrates three parts which provide a panorama of Greek civilization, revealing its social life, the mental world of Greek people and their splendid cultural legacies. "Life in Ancient Greece" focuses on its art of pottery; "Ancient Greek Religion" displays a series of sculptures based on outstanding Greek myths while "Dialogue with Celebrity" presents the sculptures of great world-influential figures from ancient Greece including Plato, Aristotle and Socrates. As we learned from the organizers, this is the first time for the precious artworks of the Louvre to arrive in Beijing. It is also the largest event of this kind in China. Another highlight of this exhibition is the maiden voyage overseas for a couple of master pieces - the statue of "Athena from the Parthenon", "Ares - God of War" and the Sculpture of Aphrodite, which used to form the very treasure with which Louis XIV decorated his Palace of Versailles. The exhibition runs from August 12 to November 9 in Beijing's Capital Museum. 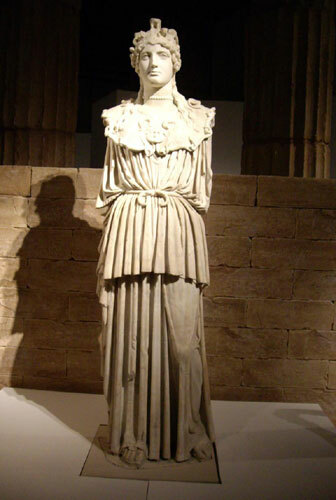 Statue of Athena from the Parthenon, wearing an elaborate decorative helm and aegis breastplate.